Let’s talk Algorithms. Fun, huh? Actually, once you understand a little bit about how the Facebook Algorithm works, it can really help you understand how to post content that your audience will actually see! First – the algorithm is the way that Facebook limits what people see in their NewsFeed. According to Facebook, at any given time, there are 1500+ stories available to show users. Facebook pares it down to about 300 stories that make it into your NewsFeed. You, as a business, are fighting for 1 of those spots! Facebook’s mission is, “To connect users with the stories that matter most to them.” That’s it. If your stories don’t “matter” to your audience, the vast majority of them won’t even see your posts in their NewsFeed. So here’s how the algorithm actually works. When you post, Facebook serves the post out to a small number of people. They serve it to people who are MOST likely to be interested in it and interact with it by liking it, commenting, clicking on it, or sharing. If those people DO interact with the post, Facebook says, “Oh, this is good! People are interested in this!” and they serve it to more people. And so on. Conversely, if the post goes out to the initial small group of people and they do NOT interact with it, your reach is done. Facebook says, “People are not going to be interested in this post.” They do not keep serving it to more people, and your post is not widely seen. What this means: You need people, especially at the beginning, to grab onto your content and be excited about it! You may wonder, what criteria does Facebook use to select what goes in the NewsFeed? They take into account only: Likes, Comments, Clicks, and Shares. Also, these 4 actions are weighted, with Shares having the most “pull.” If lots of people are sharing your post, it will cause it to reach the most number of people. We need to be creating “action-worthy” posts on Facebook. Post top-notch photos and video. Ask great questions. The questions that do best spark nostalgia or a good feeling in people. Make it easy for people to respond. Post questions that require 1 word answers, or better yet, make them multiple choice! People are much more likely to comment when it’s a very quick process. Create posts that value your audience’s opinion. For example, post 2 different options of something you are considering and ask them what they think. People LOVE to give their opinion and feel like they are impacting your brand. Create “pin-worthy” images. If you spend must time on Pinterest, you will notice that graphics that catch your eye are beautiful and compelling, with text that clearly states what they are about. You know just by looking at it what you will be reading about. Create suspense about new developments or products. And then have a quality “reveal” image and post. When people are excited about new products or services, they want to share and tell their friends. 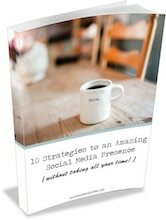 Use an image that will grab their attention! Create curiosity in your text. Give a teaser about what they will find in the article without giving everything away. Experiment with all 4 “types” of posts: video, text, photo, and link. People respond to each of those types of posts differently. That being said, there’s no doubt that video is KING on Facebook right now! You can easily put together little videos, even if they are just slideshows of photos, they grab your audience’s attention quickly. And of course, try Facebook LIVE! Though it may seem intimidating at first, this is a great way to personally connect with your audience and let them see a face of your business that they would not normally see. (Read HERE, HERE, and HERE to learn about using Facebook Live for your business). 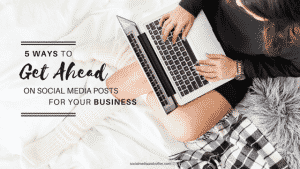 Follow these tips in your posts and watch as your posts reach more and more people! This ultimately turns them into loyal fans, which means more sales for your business.